An Irrevocable Life Insurance Trust (ILIT) is usually the owner and beneficiary of these policies which provides an income tax free and estate tax free death benefit. The premiums were usually funded by annual gift exclusion and/or lifetime exemption gifts of cash to the ILIT. The survivorship ILIT was and still is an exceptional legal, tax, and financial arrangement. Whole life, universal life, and variable survivorship life insurance policies were all sold in very large volumes by almost all major life insurance carriers in the United States to wealthy estate owners in their 50’s, 60’s and 70’s. These policies tended to accumulate a significant amount of cash value under the policy designs available in the 1990s and early 2000s. As you can imagine a significant number of these contracts have experienced the death of one of the lives that were insured. Of course, no death benefit has yet been paid on these policies because the death benefit will not be paid until the second death. This scenario provides an opportunity to review the existing policy. Certain planning options may even decrease or eliminate the premium outlay for the survivor depending on the specific facts of the case. One planning concept is known as “Survivor Survivorship” which involves an IRC Section 1035 exchange to a no-lapse single life Universal Life (UL) contract owned by the very same ILIT that currently owns the existing survivorship life insurance policy. The surviving insured, often a widow, is now 15-20 years older than when the policy was originally purchased. So, medical underwriting of a new single life no-lapse UL policy for an insured now in their 60’s, 70’s or 80’s will usually be one of the major hurdles to successfully complete the 1035 exchange to a new carrier. 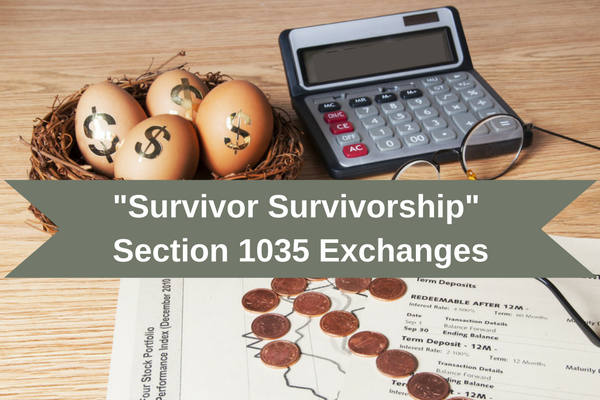 The IRS has actually endorsed tax-free Section 1035 exchange treatment of a survivorship life insurance policy, following the death of one of the insureds, for a single life policy that insures the survivor alone. In PLR 9248013, the IRS noted that at the time of the exchange, both policies were insuring the same single life and the new policy would better suit the policy owner’s needs since it was less costly. The IRS reached the same conclusion in PLR 9330040 where a survivorship life insurance policy was exchanged after the death of one insured for a policy insuring only the survivor. Contrast the facts above to a situation where a policy owner may wish to exchange a single life policy for a new survivorship policy. In PLR 9542037, the IRS concluded that this type of exchange does NOT qualify for tax-free treatment under Section 1035. The IRS said that a single life to survivorship exchange does NOT “relate to the same insured” and any gain amount in the single life policy would be taxable income to the policy owner. So, the bottom line for successful Section 1035 exchange is this: Single life policies can only be exchanged for another single life policy. Survivorship policies where one insured has died can be exchanged for a single life policy. And survivorship policies with both insureds still alive can only be exchanged for another survivorship policy. Effective for tax year 2017, the estate tax exemption is indexed up to $5,490,000 for single individuals and $10,980,000 for married couples. This may cause estate owners who purchased their survivorship policies in the 1990s and early 2000s when the estate tax exemption ranged from only $600,000 up to $1,000,000 to question whether or not they need insurance at all. In addition, part of President-elect Trump’s tax reform proposals for 2017 are to totally eliminate federal estate taxes. Whether this proposal becomes a reality remains to be seen as the U.S. House and U.S. Senate craft their own tax reform bills. 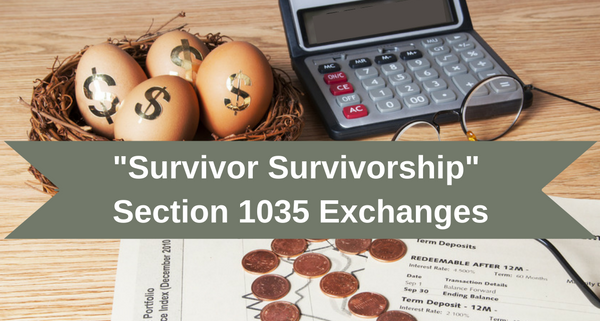 Since federal estate taxes may or may not currently exist for certain estate owners because of the high estate tax exemption or potential repeal under the Trump proposals, a life insurance professional should focus on whether a Section 1035 Survivor Survivorship Life Insurance exchange produces a good financial result from an IRR at life expectancy point of view. The after-tax IRR at life expectancy on a typical single life no-lapse UL contract can range up to 5% assuming preferred medical underwriting. In a 35% combined income tax bracket, the pre-tax equivalent IRR can range up to 7.7%. This IRR is very competitive when compared to alternative non-guaranteed and taxable financial alternatives like money markets, CD’s, bond mutual funds, and U.S. government securities in this continuing low interest environment. A good case can be made that no-lapse UL insurance should be part of the asset allocation of a portfolio regardless of whether a client may be exposed to federal estate taxes or not. Contact your BSMG life insurance advisor to discuss whether a “Survivor Survivorship” exchange should be explored for your widow or widower client who originally purchased a survivorship policy years ago.